The bright Sb spiral galaxy Messier 106 (M106, NGC 4258) is perhaps about 21 to 25 million light years distant. It is receding at 537 km/sec. Sandage suspects it may be a member of the Ursa Major cloud, a loose agglomeration of galaxies which probably also homes M108 and M109, while Tully lists it in the Coma-Sculptor cloud, and Fouque et.al (1992) in a group called Canes Venatici II (CVn II) group or M106 group of galaxies. While M106 is usually classified as peculiar "normal" spiral of type Sb (or Sbp), Tully classifies it as SABbc, i.e., intermediate between Sb and Sc, and intermediate between normal and barred spirals. As its equatorial plane is similarly inclined to the line of sight, many features resemble what we know from the Andromeda galaxy M31. As Alan Sandage mentions in the Hubble Atlas of Galaxies, this orientation explains partly why the dust lanes are so prominent in this galaxy. They form a spiral pattern which can be traced well into its bright central region to the core. The spiral arms apparently end in bright blue knots. These knots are most probably young star clusters which are dominated by their very hot, brightest and most massive stars; the occurance of these hot stars indictes that these clusters cannot be very old, as such massive stars have only a short lifetime of a few million years. So the blue knots show us the regions of very recent star formation! Following the spiral arms in the sense of rotation, and most conspicuous on the right of our image, is the yellowish remnant of an older spiral arm. The color of this arm indicates that its more massive stars have ceased to shine long ago, the color of the remaining ones sums up to the yellow-greenish appearance. The age of the stellar population in this fossil spiral arm is estimated by J.D. Wray to amount several hundred million years. Since the 1950s, M106 has been known to have a much larger extent in the radio radiation than in visual light. In 1943, Carl K. Seyfert had listed this galaxy among the galaxies with emission line spectra from their nuclei, which are now called Seyfert galaxies. 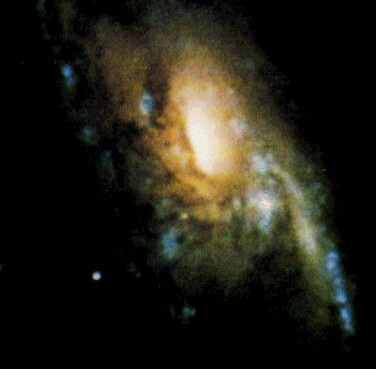 Nevertheless, only few modern studies of Seyfert galaxies include it, although its nucleus is classified as Seyfert 1.9, according to the NED data of this galaxy. 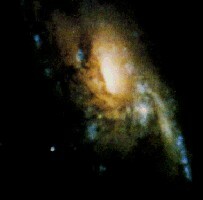 M106 is one of Pierre Méchain's findings, which were later appended as additional objects to Charles Messier's catalog. In case of M106, it was Helen Sawyer Hogg who added it together with M105 and M107 in 1947, but it appears reasonable to assume that already Méchain had intended to add it to a future edition. William Herschel had numbered it H V.43 when cataloging it on March 9, 1788. In 1995, investigations with the Very Large Baseline Array radio telescope equipment gave evidence that M106 is possibly the home of a massive dark objects, which could be traced to the lowest distance from the center ever possible up to now: 36 million solar masses apparently reside within a volume of about 1/24 to 1/12 light year radius (27,000 to 54,000 AU). This was then the densest matter concentration ever detected. The dense disk around this object works as a maser (Microwave Amplifier by Stimulated Emission of Radiation, i.e. a microwave laser). Thus nuclear maser ring allows a geometric distance measurement, independent of other distance indicators such as Cepheid variables, given by James Herrnstein in his PhD thesis (Herrnstein 1997, and NRAO Press Release). He obtained a distance value of 7.3 +/- 0.4 Mpc (23.8 +/- 1.3 Mly), stated to fit with available Cepheid data. The active center also emits jets, as was described by Brent Tully, Jon Morse, and Patrick Shopbell in Sky & Telescope, Nov 1995 (p 20). This makes it similar to the central "engines" in other active galaxies. A supernova (1981K) occured im M106 in August 1981 and reached 16th magnitude (Kenneth Glyn Jones's book, in the table on page 32, misprints "1931K"). James Rezso Herrnstein, 1997. Observations of the Sub-Parsec Maser Disk in NGC 4258. PhD thesis, Harvard University (08/1997) [ADS: 1997PhDT........10H] - thanks to Bill Keel for pointing to this reference. NRAO, 1997. Radio Astronomers Set New Standard for Accurate Cosmic Distance Measurement. NRAO Press Release of June 1, 1999.